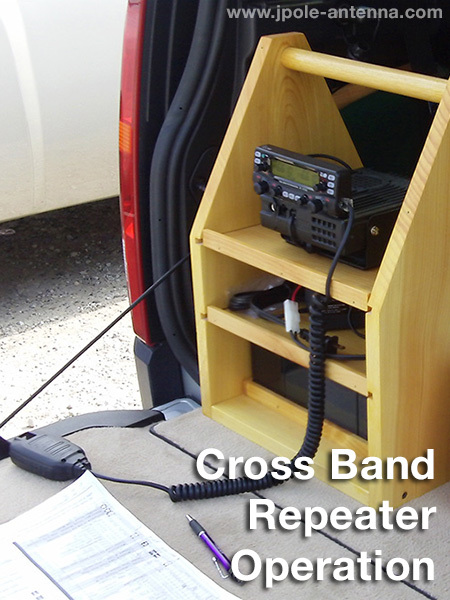 The cross-band repeat function; you’ve probably seen that feature listed in the operation manual as a function of your dual band mobile radio, or saw it as a feature in a VHF/UHF amateur radio advertisement. But what does cross-band repeat do, and how can you use it? In this post we’ll discuss cross-band repeating, it’s operation, and legal issue involved in doing so. Simply put, cross-band repeating is an effective way to extend the range of your handheld radio. The cross-band repeat function works by using using a dual band mobile or base radio to retransmit on one frequency band a signal received on another frequency band, and vice versa. A common use of the cross band repeat is to extend your range of a handheld radio by using the higher power of your dual band mobile transceiver to hit a distant repeater. 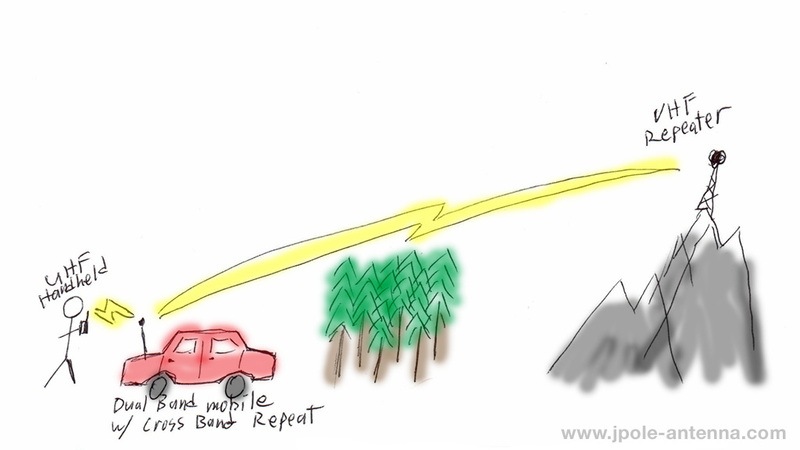 The best way to explain how cross-band repeat works is to use a practical example. Say you are volunteering for a bike race and will be stationed in a remote location. Communications is important, but you also don’t want to be tied to the radio in your vehicle. But your handheld radio is also unable to hit the repeater that is being used for the event. 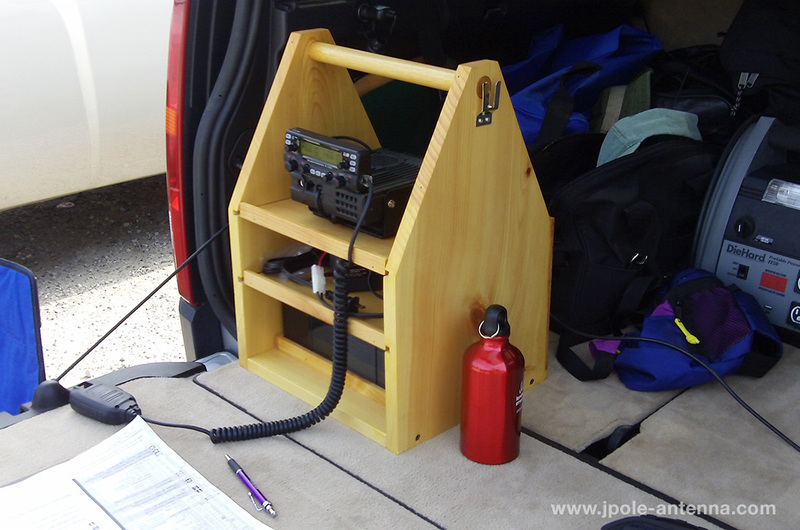 So you decide to place your new dual-band mobile rig into the cross-band mode. In order to Cross-band repeat, you’ll need a dual band/dual monitor mobile radio and a dual band or UHF capable handheld radio. You will use the UHF channel on your handheld to communicate to the dual-band mobile. The mobile then takes that signal and simultaneously transmits it on a VHF frequency (either VHF simplex or repeater). When the VHF station or repeater makes a transmission, the mobile radio receives is and retransmits the signal on the UHF simplex frequency. This is the cross-band repeat process. Cross-band repeat is great to use when you are out in a remote location and want to monitor the repeater with your handheld, but your handheld may not have enough power to make a solid transmission to the repeater. Maybe you’re in a wooded area or highly urban and the trees or buildings are shielding too much signal from your handheld. Or with our bike ride example, you want to have the ability to wander the grounds and still be able to stay in touch with the net control station. So on our bike race, our high powered mobile mounted in the car, with 50 watts of power and a higher gain antenna has no problem hitting the repeater. Engaging the cross-band repeat function on the mobile, and tuning your handheld to the simplex frequency allows you to go about your business and still stay in touch. When the repeater transmits, the mobile will retransmit to your handheld, and when you transmit on your handheld, the mobile receives it and retransmits it to the repeater. First step in using cross-band repeat is to read and understand your radio’s operation manual. Each manufacturer implements the cross-band repeater a little different, so you’ll need to know how to turn it on and off. But basically, you’ll dial a VHF memory channel on the primary VFO side of the radio and a UHF simplex memory channel on the secondary VFO. Once that’s done, you’ll hit whatever function key combination necessary to engage the cross-band repeat (be sure to practice this at home before doing this at the event). Then make a short test transmission to make sure everything is working. Once you’re satisfied, you can wander as far as you want from your cross-band transmitter and as long as you’re in range, you’ll be able to monitor the repeater and make the transmissions. It’s important to note that in order for this to work, you need to use both a VHF and a UHF channel. cross-band repeat won’t work with two UHF channels or two VHF channels. The mobile radio’s filters are small and they will overload if the transmit and receive frequency are in the same band. Cross-band repeat only works with a two simplex frequencies (one UHF & one VHF) or a UHF simplex and a VHF repeater pair frequency. Never try to cross band two repeaters. The squelch tail and hang time on the repeaters will cause an endless loop in the cross band, locking up both repeaters until you disconnect the power on your transceiver. When you operate in cross-band repeat mode, make sure that you allow time for the system to activate. When making the transmission, wait at least one second after pressing the mic key and before speaking. This will give the cross-band transmitter and the 2 meter repeater time to activate. Otherwise your transmissions will cut off at their beginning. Also wait for the repeater to drop the carrier before transmitting in the cross-band mode. When you transmit, you identify your transmission with your callsign. The incoming UHF transmission is identified, and the outgoing vhf transmission is identified, since you are the control operator of your handheld radio and of the cross-band transceiver. On the other side of the transmission, the repeater identifies its own transmissions. That transmission is then retransmitted by the cross-band transceiver on the UHF channel. But this UHF transmission does not have your callsign attached to it, so it’s an unidentified transmission. Most cross-band repeat capable radios are designed with this fault, although two newer models on the market: Kenwood’s TM-V71A and TM-D710 now have the ability to identify the outgoing UHF transmission. So to be completely legal in this regard, you either need to have some type of automatic ID system attached to the radio, or use a model with an automatic identifier feature. The ARRL has more information on Auxiliary Stations and how to conform to the rules. Now I’m not advocating that your break the FCC rules, but history has shown that they will turn a blind eye to cross-band repeat use as long as you don’t create harmful interference. This includes keeping your transmit power down to a reasonable level and using the cross-band repeat on an itinerant basis. If you are using cross-band repeat for extended periods of time or are creating interference with it, then yes, you will attract the attention of Official Observers and the FCC. So use it sparingly and only when necessary. I find cross-band repeating useful at home when I want to monitor a repeater that my handheld radio can’t otherwise receive. Say there was a net or some other activity I wanted to hear and didn’t want to sit in the shack for it. I’ll dial up the repeater and engage cross-band. Now I can wander about my home and hear the activity and making transmission if I needed too. The 2 meter J-Pole antenna and 2 meter Slim Jim antennas work well as dual band antennas. Their UHF coverage is a little weaker than on the 2 meter side of things, but it’s plenty good for short range communications with a handheld radio around my house and neighborhood. I am new (3 months) to amateur radio and I am starting with a 2m and 70cm radio. It appears to me that your j-pole (the original) will do great on those bands as well as public service reception. Please advise at your convenience. Thanks for your comments. You are correct, the 2 meter J-Pole antenna is a great choice for both transmitting on the 2 meter band and receiving public safety communications. I like to use one as a scanner antenna just for that reason. The antenna is very broad banded, so it will receive a very wide range of frequencies. I have been volunteered to give a short presentaton on cross band repeat at Chickasaw Amateur Radio Association where I am a member. You have a very good article here that explains in simple terms,may I have your permission to use some excerpts from this article to include in my presentation. Go ahead and feel free to excerpt my article for your club’s presentation. If you’d like I can throw a few business cards in the mail to hand out at your next meeting. Absolutely false. You just have the person you are in QSO with identify your inbound transmitter for you, using his voice. Simple. In worse case, where there is nobody on the “other side” after you put out a call, etc, you can simply switch your radio over to the “other side” of the cross band and verbally ID so that the inbound transmitter gets ID’d. Automatic ID certainly does make it easier, but it is not necessary. This is a great article. Certainly appreciated. I am looking for some reliable information on the antenna separation required for a 440 / 2m crossband repeater.